Edwards Co-operative Education Program celebrated its 10th-anniversary last week. 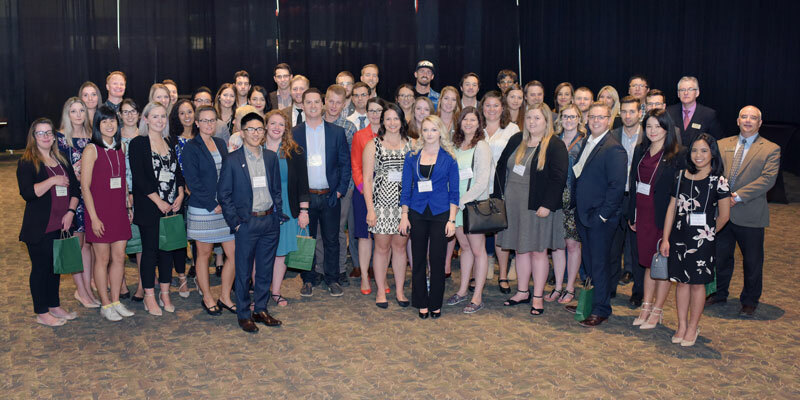 Current and former co-op students and employers attended a special event at Prairieland Park to celebrate the success of the program over the past decade. Over 110 current undergraduate students were able to meet local business representatives at the Networking Open House, and 97 returning students showcased their recent 8-month experiences. “Not only did I have the opportunity to experience the co-op program as an Edwards student, I was also pleased to be able to recruit from the same program as a Human Resources professional,” says Lyle Acoose, one of the first students through the co-op program and current benefits specialist at Potash Corporation of Saskatchewan. The co-op program has consistently boasted high employment rates among its participants. In 2016, 92% of B.Comm. graduates who participated in the co-op program found employment, compared with 82% of non-participants. Heather Ryan, vice-president of human resources at Federated Co-operatives Limited (FCL) says the organization is proud to continue their partnership with our co-op program. “We have participated in the Edwards Co-operative Education program since 2009, providing 63 students from every major with valuable and meaningful work experience,” she says. “The program has been mutually beneficial as many of the individuals that started with FCL as students have continued on as valued team members in our organization.” In 2015, FCL extended its partnership with us, committing to providing $500,000 over five years. Contact Edwards Career Services to find out how your company can hire a student for an eight-month placement: coop@edwards.usask.ca or 306-966-1454.